Hope you all have a great Saturday planned, hopefully by the time blogger publishes this I will be on my way to the Craft Show with Lorna so I shall enjoy my day hope you enjoy yours. Just love it Pat, butterflies, flowers and a touch of a vintage as well. Hope you have a good weekend and enjoy the craft show. Great card hun, love the colours & die cuts you have used! Pat, I am sure you are enjoying your day trip...wish I were there, lol. I love the golden browns of your beautiful card. These colors are always so warm and comforting to me. So very pretty Pat and I sure wish I could go to the craft show with you -- you have to tell us all about it! Wow Pat this is truly a wonderful creation the colours, design and that decoupaged image of the rose looks awesome, I really love this big time. 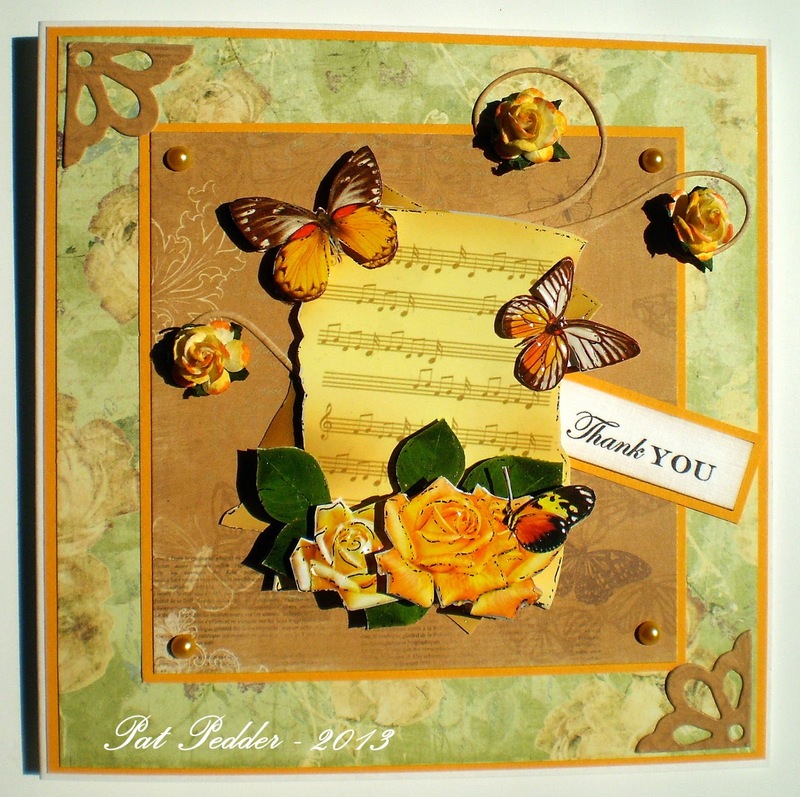 Gorgeous butterflies and a beautiful card Pat. Have a wonderful time at the craft show and let me know if you find anything new. "Hugs"
Great card, love all the butterflies and colours used. Butter flies and roses - 2 of my favorites! Hope you had a great time at the Craft Show! Absolutely gorgeous Pat, love it!